The Recycling Center is on the same property as the Old Dixie Hwy. Landfill and Convenience (directions above). Follow the same directions to arrive at 4189 Old Dixie Hwy. 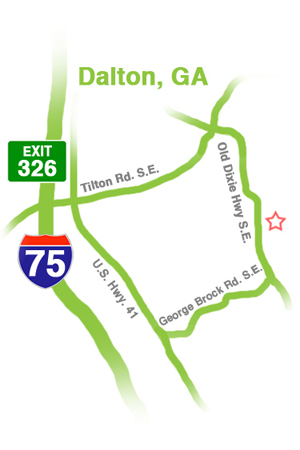 SE, Dalton, GA.
Click here to Download a PDF with directions to the Recycling Center. When you arrive at the gate, keep going straight along the white fence in the middle of the two small buildings. You'll see a stop sign. Keep going straight and veer right at the median. The Recycling Center is the first building on the right at the end of the median. Visitors to the office area should park at the front of the two story tan building where the flag poles are. Deliveries should call 706-278-5001 for specific instructions about what side of the building to drop-off their particular materials. Pick-ups should also call 706-278-5001 to schedule a pick-up time and receive further instructions.